CoilArt Mage Box Tricker Kit Review - Daily Vaping Deals & The Best Vape Product Reviews at Vaping Cheap! CoilArt is a company who’s well known for their RTAs such as the Mage RTA and Mage GTA. They’ve now entered the box mod market by releasing their newest vape kit which includes the CoilArt Mage Box Mod and the CoilArt Mage RDA. Rather than going with a traditional box mod with a screen and wattage adjustment buttons, the Mage Box Mod is a variable voltage device. It is certainly interesting to see CoilArt take this direction, and we’ll see in this review how the entire kit performs! Before getting any further into this review, I’d like to thank 3avape for sending this product to us for the purposes of this review. I will go over my first impressions, building and wicking, usage, performance, pros and cons, and conclude with whether I recommend the CoilArt Mage Box Tricker Kit! Click Here to Check Out the CoilArt Mage Box Tricker Kit! When first receiving the CoilArt Mage Box Tricker Kit I was quite surprised with the size of the packaging. Since this is a full kit rather than just a single box mod or atomizer, I did expect the packaging itself to be quite large. However, this is certainly not the case, and everything within the packaging it kept secure, which is a pro in my book. The front of the packaging has an image of the full kit alongside the name of the product. On the back, it does give you some information such as what is included and minor details about the device. Inside of the packaging you do receive the CoilArt Mage Box, CoilArt Mage RDA, spare parts, o-rings and a screwdriver. The device itself is wrapped in a plastic, which is a nice touch for sure. I do want to mention right away that as soon as I initially opened the box, it reeked of machine oil. This is definitely a con in my opinion, as it does take some effort for the smell to actually go away. The device and RDA did smell of machine oil, but there wasn’t much machine oil on the RDA itself, just the smell, which is a good thing. Regardless, I did have to wash it with soap and warm water to make sure the smell was gone. 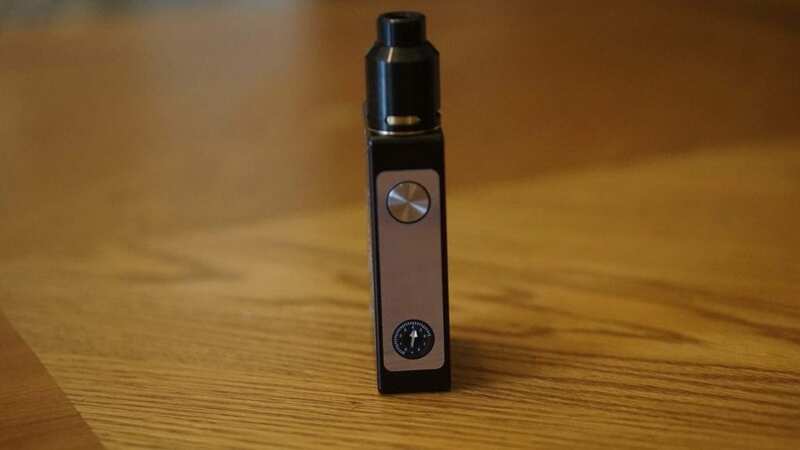 The box mod itself features a fairly simple design, and it reminds me of devices from a few years ago. It does have a square type of look, but all of the edges are pretty smooth, so it wasn’t uncomfortable to hold. On the front of the device, it is quite shiny, and it does have LED lights which will indicate battery life once two 18650 batteries are installed. This is surely a nice addition to this type of device, as knowing your battery state is always a good thing. I do want to mention that there is a lot of branding going on with the front and back of this device. This might be seen as a con to some vapers, as some may prefer a simple look rather than all of this branding it has. I’m on the fence about this one. The battery door easily slides off on both sides, and the magnets do a pretty good job at staying put. I do wish the magnets were just a little bit stronger, but I had no worries with the battery door randomly sliding off while vaping. What is weird is that the device mentions parallel inside of the battery tray, but the positive and negative symbols instruct you to insert your batteries in series. I think this is a con, as it might confuse some vapers when first receiving it. It doesn’t have reverse battery protection, so be sure if you do have this device, do not install the batteries in parallel! Moving forward with the RDA, it’s a relative simple design with fully adjustable bottom airflow. What’s great about this RDA is that it does support single coil builds, so that’s a pro. In addition, it does come with a wide bore delrin drip tip, which is perfect for keeping the heat off of your lips. The overall diameter if 24mm, and it does feature a gold plated build deck. The juice well is quite deep, and I do like the looks of it. Overall, my first impressions of the CoilArt Mage Box Tricker Kit was positive, aside from the battery tray. I’m happy the battery indications are clearly marked, but the wording could definitely confuse some vapers. The included CoilArt Mage RDA features a similar build deck to the Twisted Messes Squared RDA. It can be described as a split post deck, with a horizontal post design, but with 2 post holes on each post. Building on this type of build deck is very easy, and should cause no issues for both beginners and advanced users. I do recommend pre-cutting the second coil you insert, as this does make the entire coil install much easier. The build deck is nice and spacious, so you do have a lot of room to put your exotic coil builds such as Fused Claptons, Aliens, Staggered Fused Claptons and more. I was easily able to fit a pair of 3mm inner diameter Fused Claptons with about 7/8 wraps. This was actually my preferred coil build since the Mage Box Mod is a variable voltage device. With this specific coil build, it would span across the entire airflow hole on each side. The resistance of this coil build was 0.27 ohm. Wicking the CoilArt Mage RDA is also very easy. Simply measure your desired amount of cotton, I preferred a bit longer than usual since the juice well is quite deep. Once you have your wicks cut, simply fluff them, and gently insert them into the wicking channels. Just be sure when you are inserting your cotton to not block the airflow holes whatsoever. This can cause turbulence in the airflow, and can even cause leaking. So make sure there is no cotton in the airflow hole, which is quite easy to do. All in all, building and wicking the CoilArt Mage RDA was very easy. You have tons of room to put larger builds, and a generous juice well, which is perfect for a bottom airflow RDA. I’m sure whether you’re a beginner or advanced user, you’ll have little to no issues with this one. Using this vape kit over a period of time has been great. What’s a big pro to the CoilArt Mage Box Mod is that it does feature 5 click on and off. With variable voltage devices, many of them do not have this feature, and sometimes you don’t wanna carry it in your pocket with batteries due to the chances of it auto-firing. With this kit, you have no worries! I’m really glad that CoilArt decided to implement this as it makes it easier and provides you with a peace of mind when carrying it in your pocket or purse. With the design of this device being a bit more square, it isn’t the most comfortable mod to have in your pocket since it’s not very compact. However, it is rounded off at the edges, so it’s not that much of an issue. If you’re carrying this device in a purse or book bag, then you’ll have no worries. Since it’s rounded off on the edges, it does make it very comfortable to hold in the hands. The fire button is nice and clicky as well, which I know is something that many vapers enjoy. It’s also very easy to use as well, simply adjust your voltage, and press the fire button. Once you find the voltage you prefer, you’re all set. A lot of vapers will say this type of setup is “adjust to taste”. Just be sure you’re using high drain 18650 batteries and understand ohms law and battery safety! There isn’t any screen or anything to tell you your output power or voltage, but you can tell by the potentiometer what your voltage is set to. Adjusting the voltage can be a pain, especially if you don’t have any finger nails. Sometimes I would simply use a small flat head screwdriver to adjust the voltage. I do wish they made it a bit easier to adjust your voltage, but it isn’t a huge deal since most variable voltage potentiometers are designed this way. There are LED lights which indicate your battery state, which is a nice touch for sure. Atomizers up to 24mm will sit flush wit no overhang, which is great. 25mm atomizers will have a very slight overhang, but nothing to really to complain about. I also tested other atomizers with protruding 510 pins, and there was no gap, which is pro for sure. All in all, using this device over the past few weeks has been great. It’s incredibly easy to use and all the atomizers I’ve used worked with zero issues. Now the big question of this entire review is how does this entire kit perform? Well, we’ll first cover the Mage Box Mod. Honestly, there’s no too much to cover here since it’s relatively straightforward to how it works. 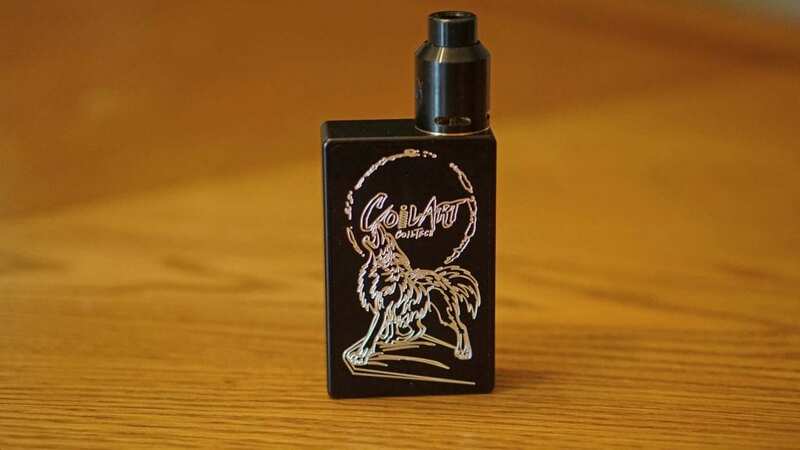 I do want to mention that it does have a maximum voltage output of 6.6v, which can be seen as a subjective con as some vapers may prefer 8.4v. However, 6.6v is more than enough for my style of vaping. Regardless, this is still something worth mentioning. The minimum firing resistance is 0.08 ohm, which is quite low. I wouldn’t really recommend building that low for this type of device, but it does claim that it fires down that low. I did test a 0.1 ohm build and it did fire with no issues. Once again, if you’re building that low, just be sure to understand battery safety and ohms law as this is crucial. With that being said, as soon as you hit the fire button, it fires instantaneously. There is zero delay, which is a huge pro in my book! It just works, and it does pack a punch. The maximum wattage output of this device is 250w, which is more than enough for most vapers. Now onto the Mage RDA! As mentioned previously, my preferred coil build was a 0.27 ohm dual Fused Clapton. With this specific coil build, I would have the potentiometer set to around 4-5v, and this provided me with a warm and flavorful vape experience. The flavor off of this RDA is very good, and much better than what I’d expected. The vapor production is excellent off of this RDA as well! The airflow can be adjusted to your liking, but I much preferred it wide open, especially with the preferred coil build. There is a slight restriction with it wide open, but if you do close the airflow off a bit, you get more restriction and the flavor intensifies. The vapor would also get much warmer as well with this amount of voltage and airflow setting. All in all, the CoilArt Mage Box Tricker Kit had fantastic performance, and I had zero issues with it during my time using it! It worked every time I hit that fire button with no delays! Honestly, the performance of this entire kit surely surpassed my expectations. In conclusion, the CoilArt Mage Box Tricker Kit is a solid performing vape kit! I had zero issues in regards to performance, and it actually surprised me by how well it actually did perform. Using the CoilArt Mage Box is incredibly easy, and the Mage RDA has excellent flavor and provides stellar vapor production as well. Even though the overall performance was amazing, there are a few cons to this vape kit. The biggest con in my opinion is the wording in the battery tray, it can simply confused vapers. They should’ve of just taken out “warning parallel” and left “do not reverse polarity” or just added “no reverse battery protection”. This is not a deal breaker to me, but I wouldn’t recommend this kit to a beginner for this reason and because you do have to have some understanding of battery safety and ohms law. However, for the advanced user looking for a simple kit that offers incredible performance, then this is perfect. There’s no temperature control or anything like that, simply install your coil build and adjust to taste! If that’s something you’re looking for, then I can easily recommend the CoilArt Mage Box Tricker Kit! We hope you find this review helpful in finding the right vape kit to fit all of your vaping needs! Feel free to leave any questions or comments down below! Thanks for reading! hello there, I bought this kit and I have an issue. I put a dual fused clapton 5 wraps (2×24 + 32) which gives me 0,11 ohm. I found that the kit fires hard when the potentiometer is at ZERO!!. If I cranked it up to 3 it is more aggressive?! the vape is more than worm and harsh. what am I doing wrong? did I get a faulty kit? or the ohms law is over writing the potentiometer setting?